WASHINGTON – Lead contamination issues at the Niagara Gun Range – where more than 600 U.S. customs agents trained for years – date to 2005, when a federal firearms instructor at the facility was found to have blood lead levels more than seven times the recommended maximum. 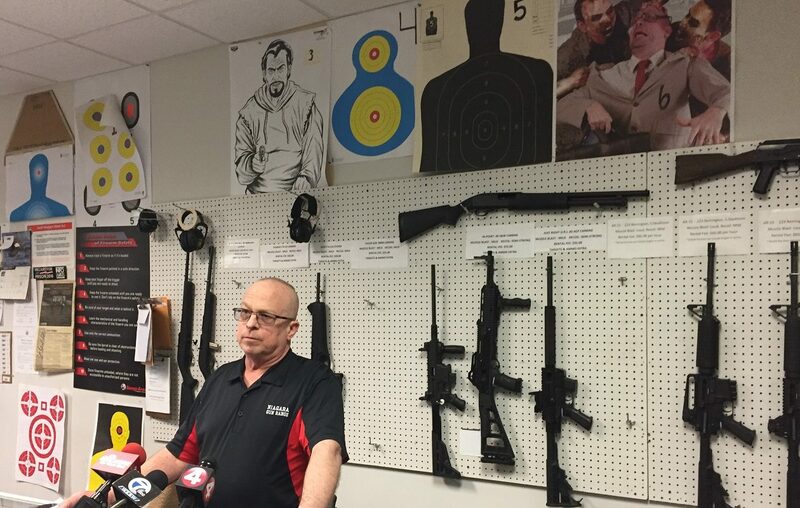 Documents obtained by The Buffalo News last week show that firearms instructor Stephen Armenia suffered those high lead levels – and that U.S. Customs and Border Protection left the facility because of lead issues in early 2016. But the Customs agency signed a contract to return to the Niagara Gun Range later that year, and a Customs spokesman said it was because the Wheatfield facility was the only one to bid for the contract. Paul Kwiatkowski, president of the union local that represents customs officers in Western New York, was enraged that the Customs agency allowed the lead contamination issue at the Niagara Gun Range to recur last year, when an inspection found high lead levels from the floor to the microwave to the coffee pot. "It shows the agency could care less about their employees," Kwiatkowski said. A Customs and Border Protection spokesman said, though, that since 2007, no local Customs officers who trained at the facility have been found to have blood lead levels higher than the threshold set by the Occupational Safety and Health Administration. The gun range recently spent $45,000 on lead abatement and has produced an environmental report from March noting it had been cleaned to federal standards. Armenia, the customs officer found to have high lead levels in his blood 14 years ago, said he wasn't surprised that lead contamination had happened again at the customs training facility. Both he and Kwiatkowski blamed the lead problem not on the Niagara Gun Range, but on Customs and Border Protection. They said the agency probably didn't follow the proper protocols for making sure the training facility was clean and that employees were safe. "Something slipped through the cracks somewhere," Armenia said. Armenia now lives in Florida and no longer works for the federal government. But he worked for years as a firearms instructor for U.S. Customs. He found out about his high lead levels after his private doctor discovered them in late 2005. The results were so high that the State Department of Health got involved, and the Customs agency removed him from the firing range. "They pulled me out of there right away, and then they slowly monitored me and my lead levels went down," Armenia said. "But to have this happen a second time? Man!" Armenia's high blood levels prompted the Customs agency to test for lead throughout the gun range on Feb. 2, 2006. The test results, obtained by The Buffalo News last week, showed lead levels at more than twice the recommended federal maximum on a table in the firing range area and on the shirt of an officer who worked in the range. Lead levels on the floor in the firing area of the rage were at six times the recommended federal maximum. In reaction, the Customs agency imposed new safety regulations on its agents and gave them additional safety training to avoid lead exposure at firing ranges, James T. Engleman, then director of field operations for the Customs agency, told Armenia in a March 9, 2006, letter. Those actions were aimed to mitigate the risks agents might face at firing ranges, which have long been seen as potential danger spots for lead exposure. That's because most bullets are made of lead, and shooting them results in lead dust that can only be controlled with proper ventilation and personal hygiene. The lead levels at the Niagara Gun Range were too much, though, for the Customs agency at the time. "As of Feb. 23, 2006, use of the Niagara Gun Range by CBP personnel was discontinued," Engleman told Armenia in that 2006 letter. All that changed at the end of 2006, said Bowker, the Customs spokesman. The Niagara Gun Range moved to a new facility about a half mile from its old one, and it bid on the contract the Customs agency was offering for a training facility. "They successfully competed again for the CBP contract which was awarded in 2007," Bowker said. The gun range bid again for the Customs contract when it came up for renewal in 2011 and 2016, and it won both times for a simple reason: The facility "was the sole bidder and subsequently won the contracts," Bowker said. The Customs spokesman also stressed that lead exposure was by no means a constant issue for Customs agents working at the gun range. "Since 2007, there have been zero incidents of any CBP employee at (the gun range) with lead blood results meeting OSHA’s medical removal criteria," although two employees were reassigned to other work late last year as a precautionary measure after registering somewhat high blood lead levels, Bowker said. He stressed that the agency routinely tests the blood lead levels of employees and did monthly safety walk-throughs at the Niagara Gun Range, which the agency abandoned again after tests late December showed unusually high lead levels there. The facility changed hands in 2016 when it was taken over by Thomas Kulwicki. He died in 2018, and his widow, Susan Kulwicki, now owns the facility. The gun range recently spent $45,000 on lead abatement, and an attorney for the facility, Gabriel J. Ferber, indicated the focus should be on that, not on lead problems that surfaced at the facility years ago. "I question the relevance to recent events of dredging up negative history that took place 13 years ago involving now dead previous owners," Ferber said. "The widow who owns the business is trying to make a go of it in the face of negative publicity that, thus far, she has been able to overcome by taking corrective action." But both Kwiatkowski and Armenia said it's relevant that lead contamination happened more than once at the facility where local custom officers train. Armenia – one of Kwiatkowski's predecessors as president of National Treasury Employees Union Local 154, which represents customs officers in the Buffalo area – said he is concerned about the health of his former colleagues and their children. Lead exposure can cause anemia and weakness as well as kidney and brain damage in adults, as well as severe developmental defects in children, according to the Centers for Disease Control. And according to an industrial hygienist's report from the Niagara Gun Range last year, one part of the floor was contaminated with lead at a level nearly 167 times higher than OSHA's recommended maximum. "If in fact these people were taking their boots home and throwing them on the floor, and you've got like a 1-year-old, 2-year-old kid, and they're crawling all over the floor, well, who's getting contaminated now?" Armenia asked.